Jack Pitts is a UK-based GIS Consultant, working in terrestrial and marine ecology. His daily work centres around the ArcGIS platform, though he takes an active interest in Open Source GIS, C# and Python programming and the Raspberry Pi. He is a member of the Association for Geographic Information (AGI) and holds a degree in GIS. 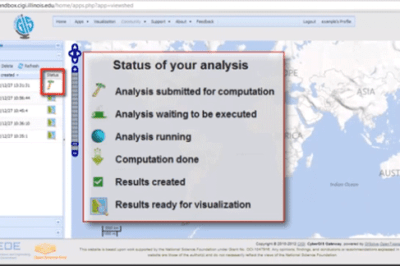 Screenshot from the CyberGIS Gateway's Viewshed Analysis web application. CyberGIS: The Next Frontier for GIS? What is CyberGIS and how will it help advance the geospatial industry? Jack Pitts, a UK-based GIS Consultant, working in terrestrial and marine ecology, writes about the field of GIS is moving towards an Internet based solution.